Interested in hosting WordPress on AWS? 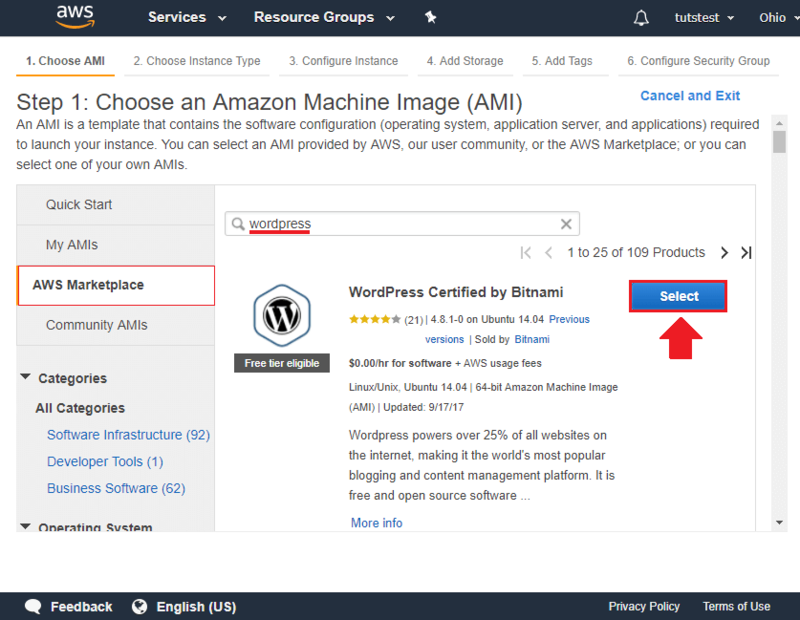 In this tutorial you will learn how to migrate a WordPress website to Amazon’s AWS cloud platform using the Bitnami version of WordPress on AWS. 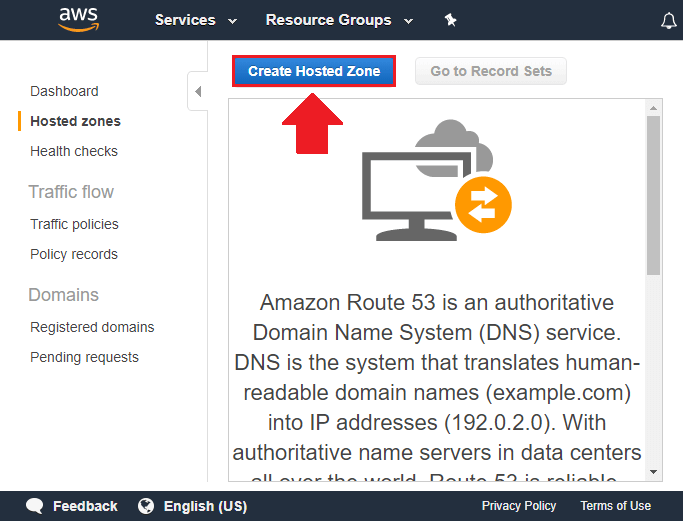 This tutorial covers all the components necessary to migrate a WordPress website to Amazon AWS, including how to install WordPress on AWS EC2, how to configure your domain name on AWS Route 53, and how to transfer an exact copy of your existing WordPress website to AWS. Running WordPress in a virtual machine on Amazon’s AWS Cloud Platform allows you to harness the full power of the cloud, and take your WordPress website to the next level. If all you’re looking to do is host a simple WordPress website, then AWS is not the best option for you; managed hosting providers are cheaper and easier to use. There are even managed cloud hosting providers such as Bluehost Cloud (view tutorial). The main reason why you should host WordPress on AWS is because you’re developing a website that you predict will grow in size and complexity over time, and you require a platform built with the infrastructure that your website will require as it grows. Before getting started with this tutorial on how to migrate WordPress to AWS, you must first create a free AWS account. 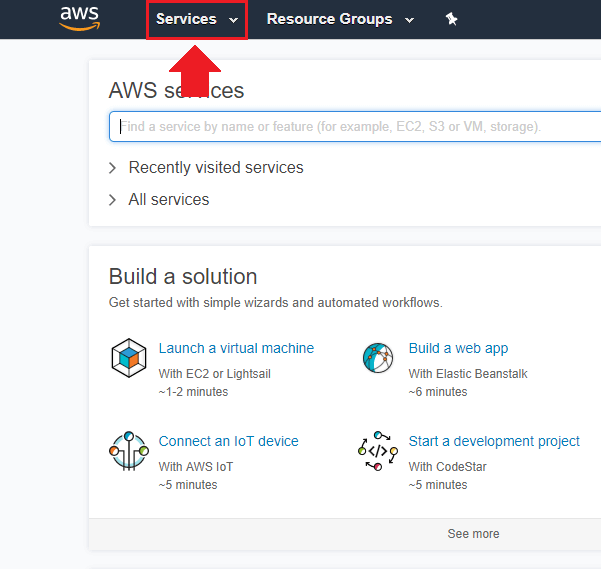 The first step in this tutorial to migrate WordPress to AWS is to install WordPress on an AWS EC2 virtual machine using a WordPress stack configured by Bitnami. By default, WordPress is built on a software “stack” consisting of WordPress, Linux, Apache, MySQL, and PHP – meaning that you need to install each of these components to your AWS EC2 virtual machine in order to run WordPress. The good news is that companies such as Bitnami have already configured and bundled these “stacks” for you. All you need to do is install them to your EC2 virtual Machine. 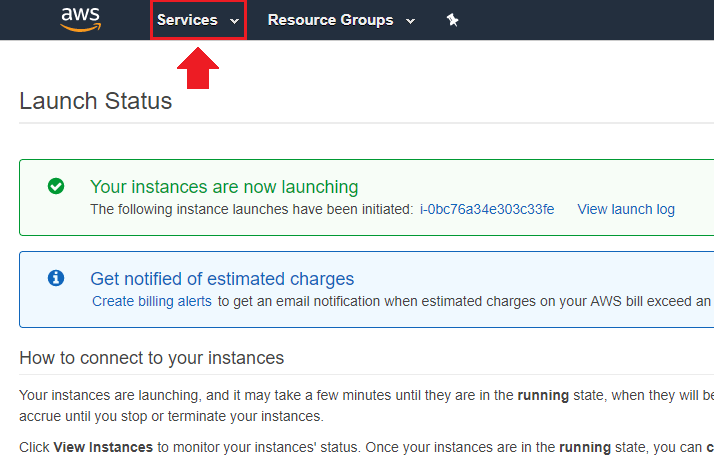 After you’ve created an Amazon Web Services account, click the Services link at the top of the page, then click the EC2 link under the compute column. 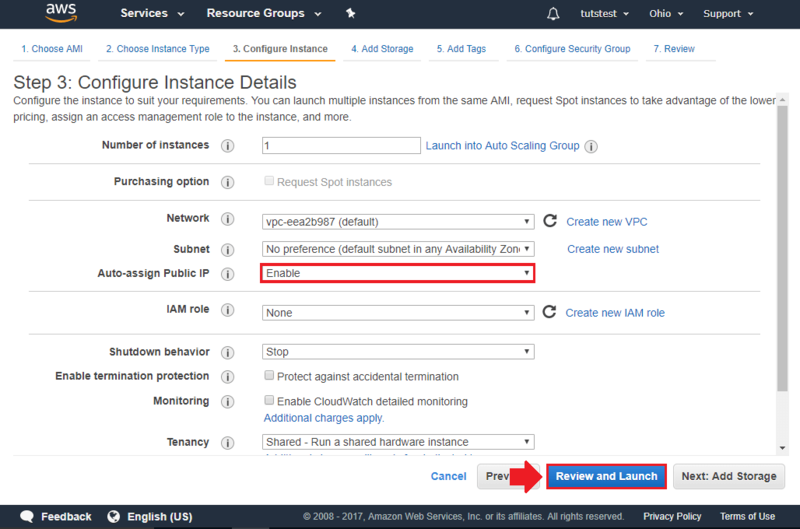 From your EC2 dashboard, click on the Launch Instance button to deploy a new EC2 instance. An “Instance” is just a fancy word to describe the Virtual Machine that will be running your WordPress installation. Now that your EC2 instance has been deployed, the next step is to install WordPress. To to this, navigate to AWS Marketplace in the left sidebar column, then search for WordPress and select WordPress Certified by Bitnami. 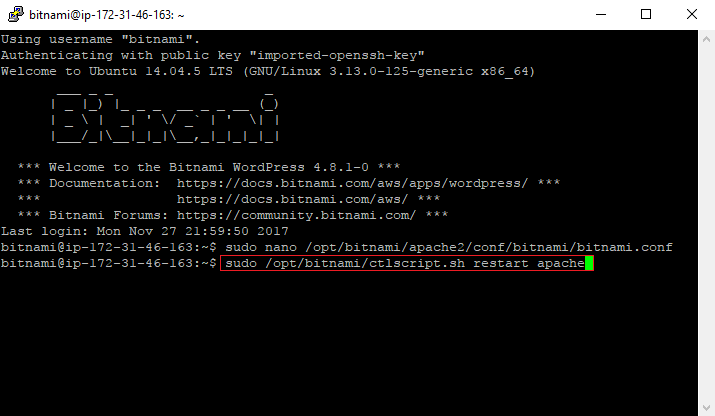 Click the Continue button after you’ve looked over the Bitnami WordPress details page. On the next page, select the instance (virtual machine) hardware that you want to run your WordPress installation. Choose the free t2.micro machine. 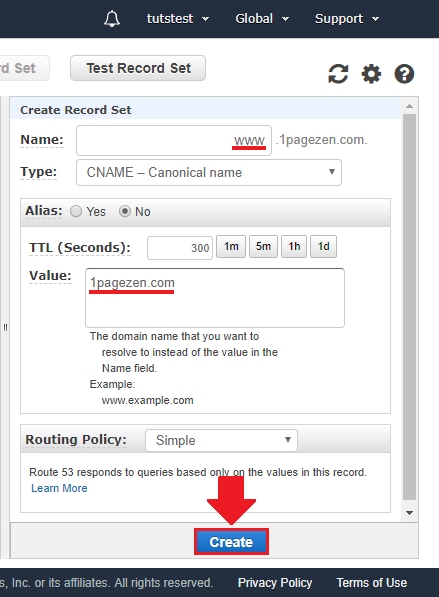 On the Configure Instance Details page, choose the Auto-assign Public IP option, and leave the other options unchanged. 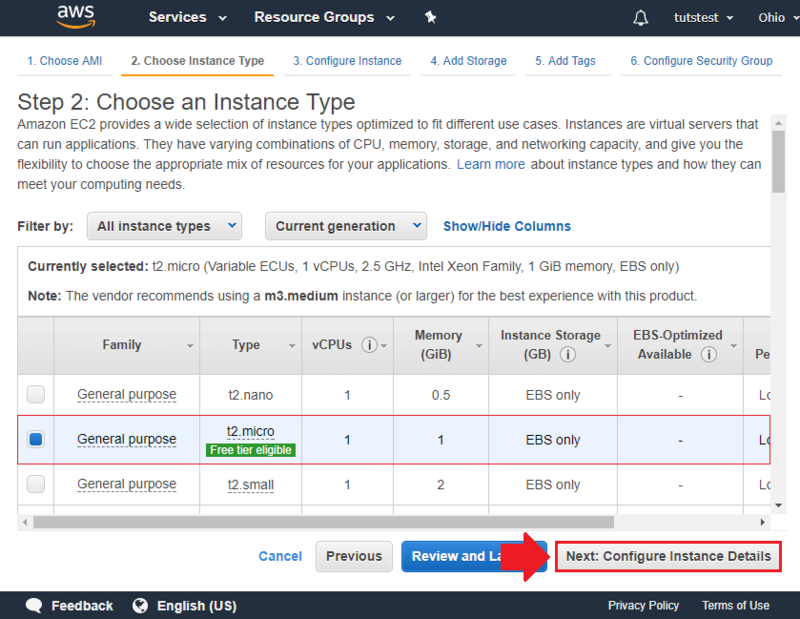 Next, click the Launch button at the bottom of the Instance Details page. Next, a popup window will appear. 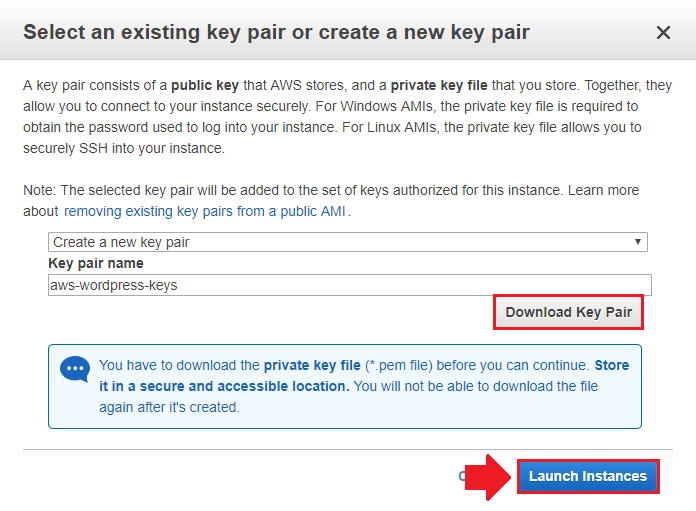 Create a new SSH key pair as instructed in the popup window. Make sure to download the key pair and save it in a safe place. Next, click the Launch Instances button at the bottom of the popup window. Congratulations! You’ve just launched a new WordPress installation. 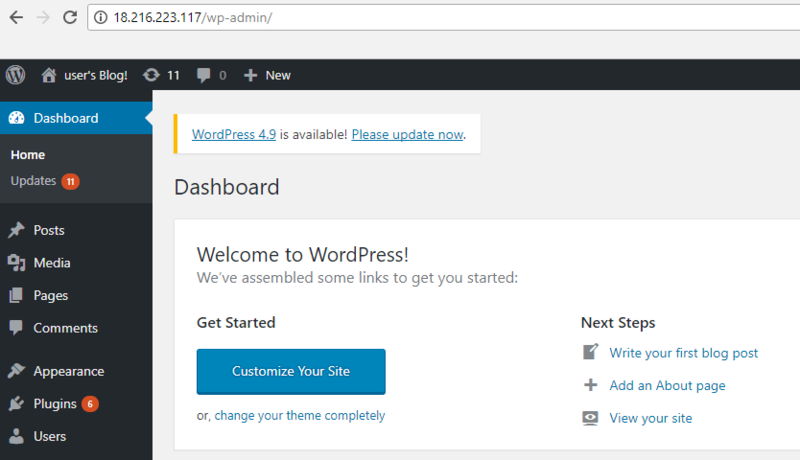 However, in order to login to your new WordPress installation, you will first have to obtain your WordPress login credentials. To do this, first click the Services link at the top of the Launch Status page. Under the Compute column, click on the EC2 link. Next, click on the Instances link in the left-sidebar column. 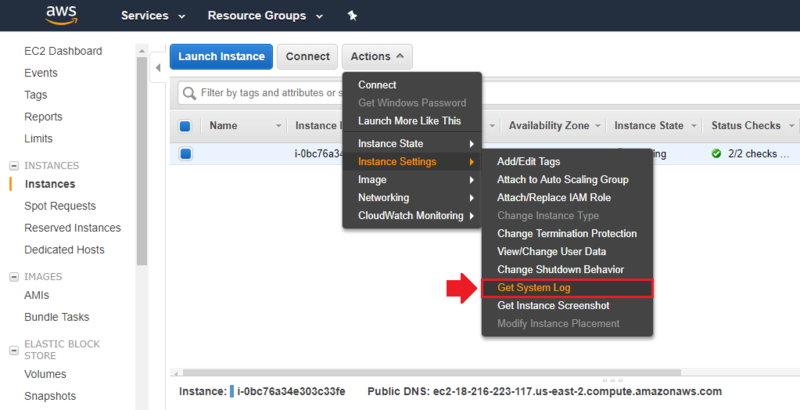 On your Instances page, click on the Actions button, then navigate down to Instance Settings then click on Get System Log. Use the sidebar at the right side of the page to navigate towards the bottom of the instance log. 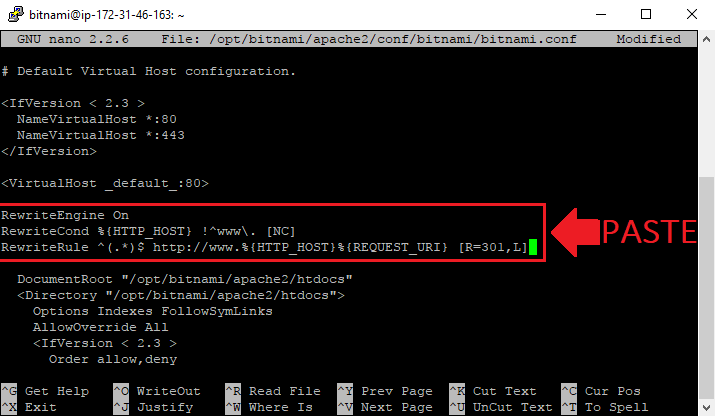 Locate and copy your Bitnami application password. After copying your WordPress password, exit out of the instance log and use the bottom scroll bar to locate and copy your Public IP address. 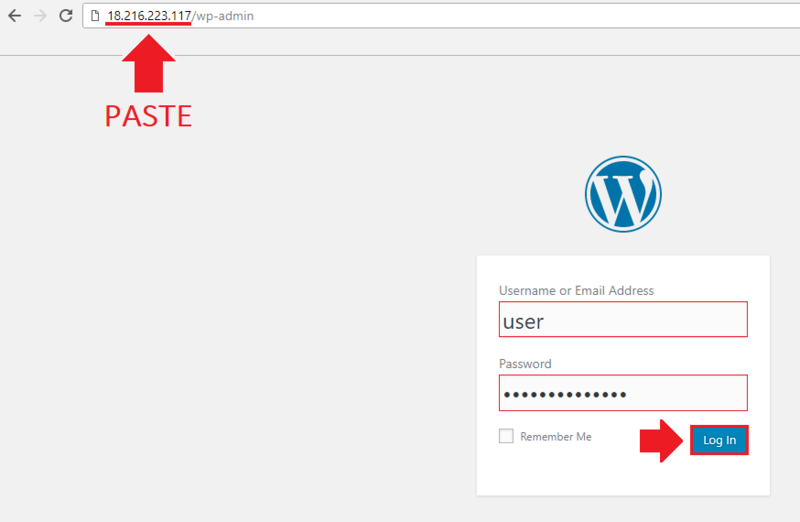 In a new browser window, paste the Public IP address followed by wp-admin – this willl take you to the WordPress login page. Enter user as the username, and paste the password that you copied from the previous step into the password field. That’s it! You’ve successfully logged in to WordPress! Great job! You’ve just installed WordPress on an AWS EC2 virtual machine! 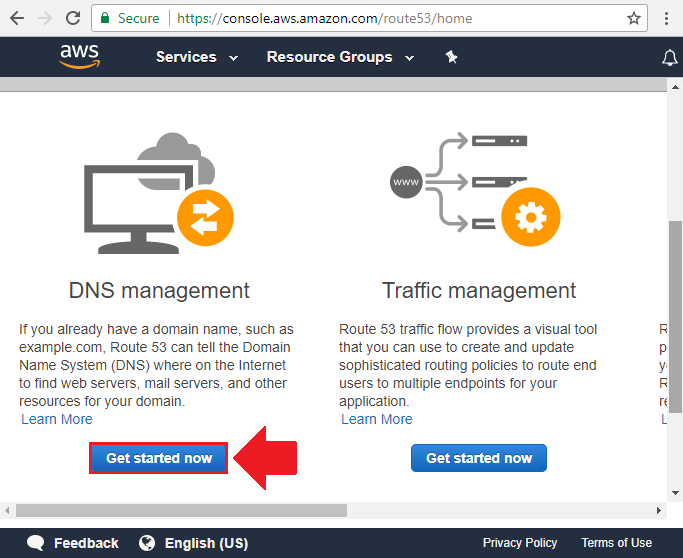 The next step in this tutorial to migrate WordPress to AWS is to transfer your domain name to AWS so that it links to your website. By default, your public IP address will be used as the domain for your website. However, using a public IP address as your primary domain is bad for your website’s SEO. In this next section you will learn how assign a custom domain name such as yourwebsite.com to your AWS EC2 instance. NOTE: Before getting started with this section of the tutorial, you may want to first export a copy of your existing WordPress website, as demonstrated in part 3 (step 2). Login to your Amazon Web Services (AWS) account, and click on the Services link at the top of the page. 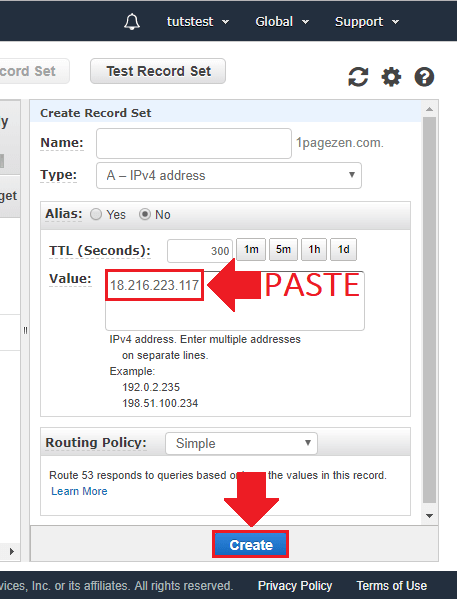 Use the bottom scrollbar to navigate right to copy your instance’s Public IP address. Click the Get started now button on the Route 53 homepage. Next, click the Create Hosted Zone button at the top of the page. 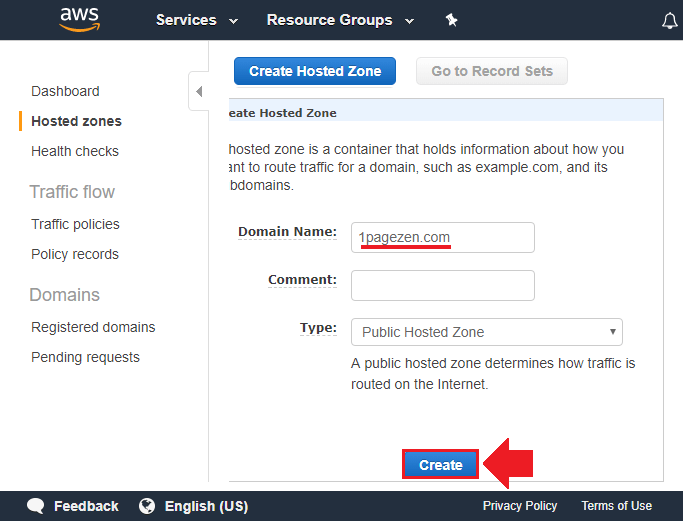 On the Create Hosted Zone page, enter your domain name in the Domain Name field, then click the Create button to create a new hosted zone. 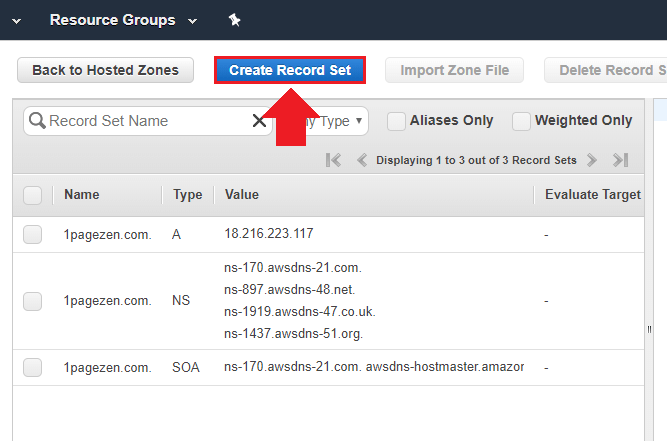 At the top of the Hosted Zones page, click on the Create Record Set button. In the Type field, select A Record, and paste your public IP that you copied in one of the previous steps into the Value field, then click the Create button at the bottom of the page. 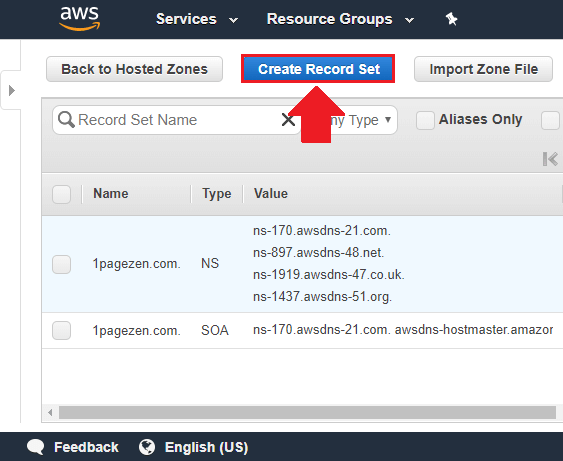 Next, click the Create Record Set button at the top of the page to create another Record. Enter www in the Name field, and select CNAME as the record type. In the Value field, enter your domain, then click on the Create button. 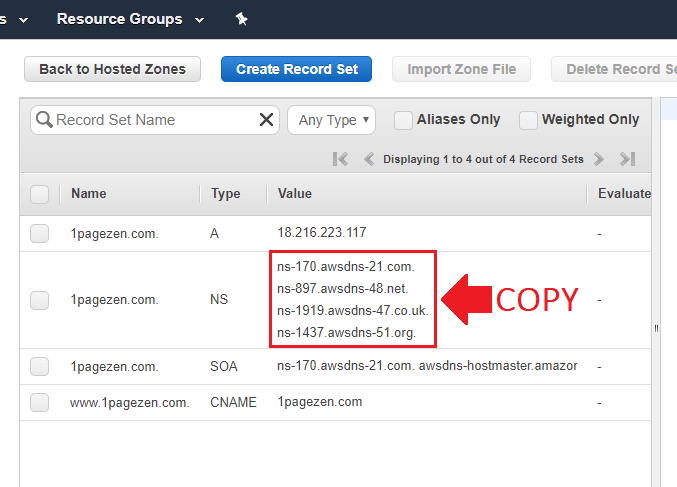 On your Hosted Zones homepage, copy the nameservers in NS section of the page. 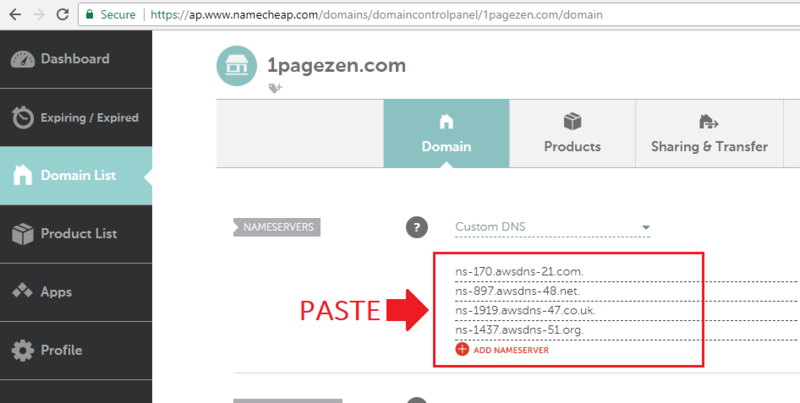 Head over to your Domain Name registrar (Name Cheap is used in this example) and assign the nameservers that you just copied to your domain. After a few minutes, try accessing your site by entering your domain name into the URL bar. If everything is configured properly, you will see your WordPress homepage. By default, your domain will show without the www. prefix. If you would rather your domain show up as www.example.com instead of just example.com, then read on for configuration instructions. 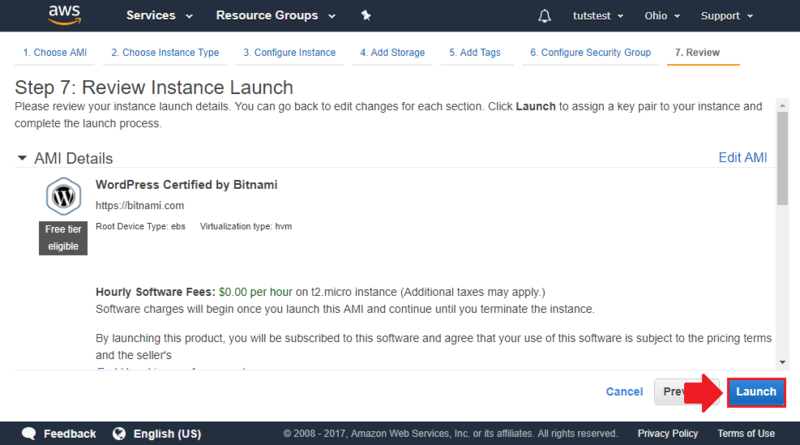 NOTE: The instructions below are intended for users running Bitnami’s WordPress stack on AWS. 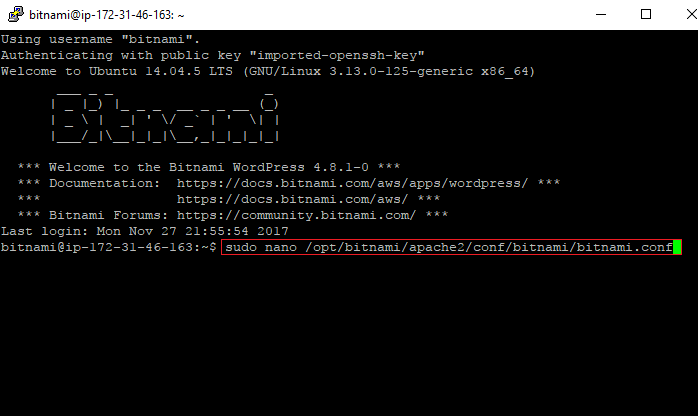 If you’re using a different Apache configuration, remember to substitute the bitnami.conf file with your server’s htaccess equivalent. In order to add the www. 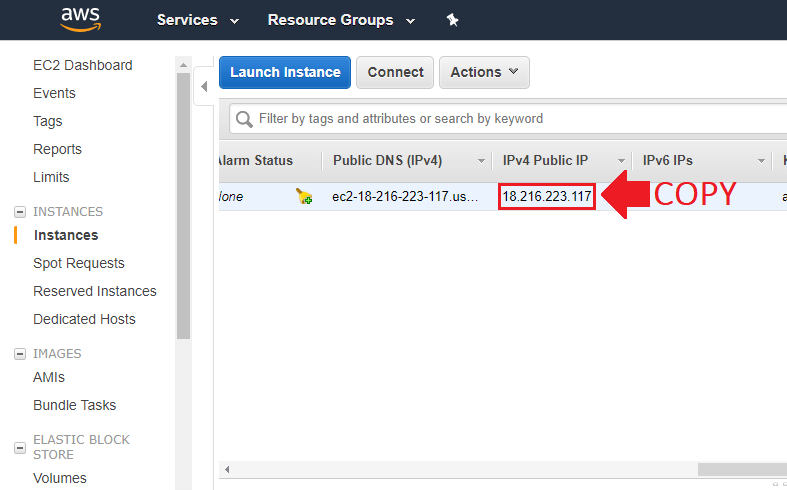 prefix to your domain, you will first need to configure an SSH client to connect to your EC2 instance. 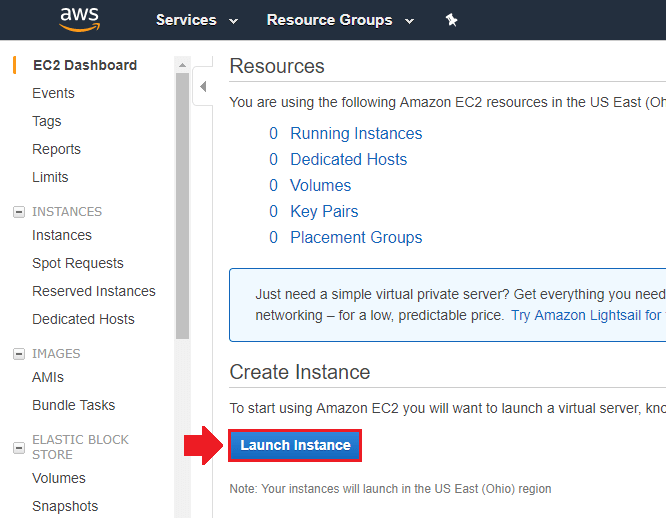 To learn how to SSH into your EC2 instance, check out How to SSH into EC2 Instances (AWS). 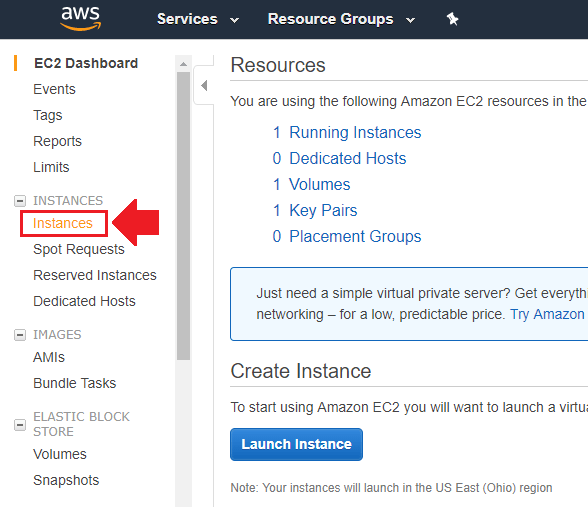 After you SSH into your EC2 instance by following the instructions in this tutorial, copy and paste the command below to open your server’s configuration file (right-click to paste). Great job! You’ve assigned a custom domain name to your new WordPress installation! Using a WordPress Migration plugin is a great time saver when transferring a WordPress website between hosting providers. The next step in this tutorial to migrate WordPress to AWS is to transfer an exact copy of your existing WordPress website to your new WordPress installation on EC2. In this tutorial, you will use the All-in-One WP Migration Plugin to quickly transfer a copy of our existing WordPress website to our new WordPress installation on AWS EC2. From your existing WordPress website (the one you want to transfer to AWS EC2), head over to “Add Plugins” and download the All-in-One WP Migration plugin. Activate the All-in-One WP Migration plugin, and access it by clicking the link in your WordPress sidebar column. 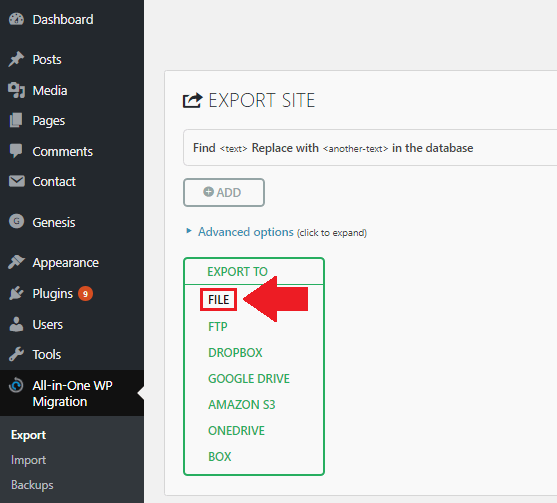 From the All-in-One WP Migration dashboard, select Export To > File. 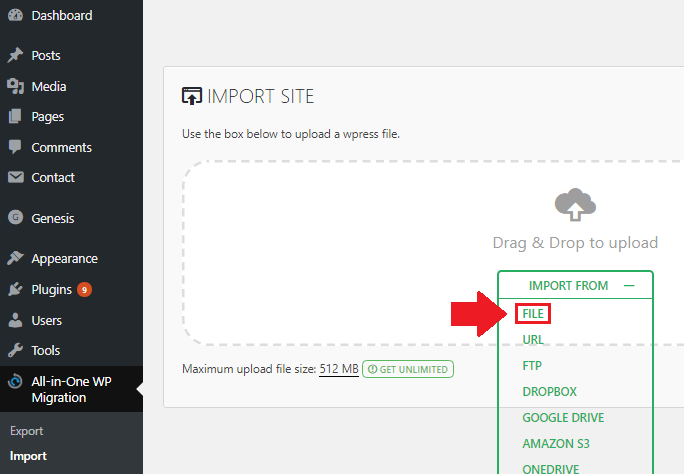 NOTE: The free version of All-in-One WP Migration plugin limits the WordPress upload file size to 512MB. If your WordPress file size is greater than 512MB, check out this tutorial on how to increase the upload size limit to 4GB+. From your new WordPress Website installation, download the All-in-One WP Migration plugin and go to Import From > File. Choose the export file that you downloaded in the previous step. 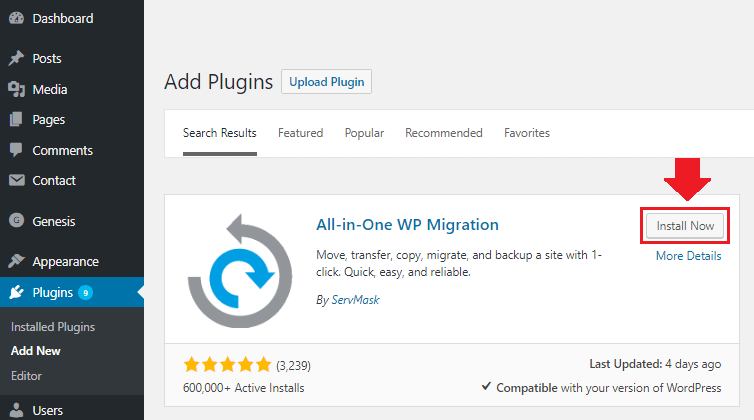 NOTE: After finishing with the WordPress migration, you can uninstall or deactivate the All-in-One WP Migration plugin. That’s it! You’ve successfully migrated your WordPress website to AWS, including installing WordPress, configuring a custom domain name, and transferring an exact copy of your existing WordPress website to AWS. If you have general questions or comments about this tutorial, please post them below. Hello, I have a mac and the putty preview you suggested is only for windows and not mac. So, how to I obtain the SSH connection? Check out the comment here for more information. Why two domains are essential? What do you mean by ‘two domain names’? Which step? I followed your tutorial, but after I got done with the Apache/SSH part and checked my domain it came back as “http://www.%(http_host)%(request_uri)/” and I don’t know how to fix it. Any advice here? I’m not sure Ryan – that sounds complicated. If you get it working, please let me know your process! hey leron your tutorials are amazing.please make a tutorial on how to protect files from being downloaded from my website using aws s3.thanks for all the tutorials. You will have to edit your Bucket policy according to your needs. There is a helpful AWS tutorial here that covers some common configurations depending on your needs. Great tutorial. i have an eCommerce site. my site does not have www. it is (https://site.com) and i have ssl from Cloudflare. how can i do these without disrupting customers shopping on my site? Practice a few times on a copy of the website and assign it to a dummy domain. Get it up-and-running a couple of times before going through with the Cloudflare configuration for the main website. Hi Gnaneshwar – I will be doing an SSL on AWS tutorial in the near future! Thanks for the material. Can you please make a tutorial regarding SSL certificate for aws please. Yes I will make an SSL tutorial for WordPress on AWS. I went through step 1 successfully and logged into my wordpress using the default user “user.” I was able to migrate everything from my local host into my new instance. However, once i clicked out of that instance in WordPreass, I wasn’t able to log back in with the same user name and password I used before. This happened to me twice and I had to delete the instance and redo everything. Should I have done something else before closing out the window of my new instance? This is a common issue that you’re describing; luckily, there’s as easy fix. After you’ve performed the migration and you’re asked to log in again, you will have to log in with the username and password of the website that you imported, not the username and password of the AWS WordPress install. Does this make sense? Aaah! That makes sense. Yes!!! I’m a happy happy girl! Thanks. Glad to hear you enjoyed the tutorial Steve – thanks for sharing your feedback! This was extremely helpful in getting my sites migrated from a share hosting setup and will probably save me hundreds. I have a few more sites to migrate but have not begin yet because they have ssl certs attached to them. Is there a way to move those over to AWS as well and if so can you point me in the right direction? You can move the certificate files as well – it shouldn’t cause any issues. I don’t have a walk-through on the topic, but it should be as simple as transferring the certificate files to the new server, then making sure that the certificate paths (and permissions) are correct in your Apache configuration (which depends on which directory you upload the certificate files to). If you’re using Let’s Encrypt certificates, then don’t bother with the process, and go ahead and re-issue new certificates. Awesome – I’m glad to hear you were able to get it working! Also thanks for sharing the link – I’m sure other users are looking for a similar tutorial. I am quite a beginner here. I am confused with the exporting of website file. Correct me if I am wrong. 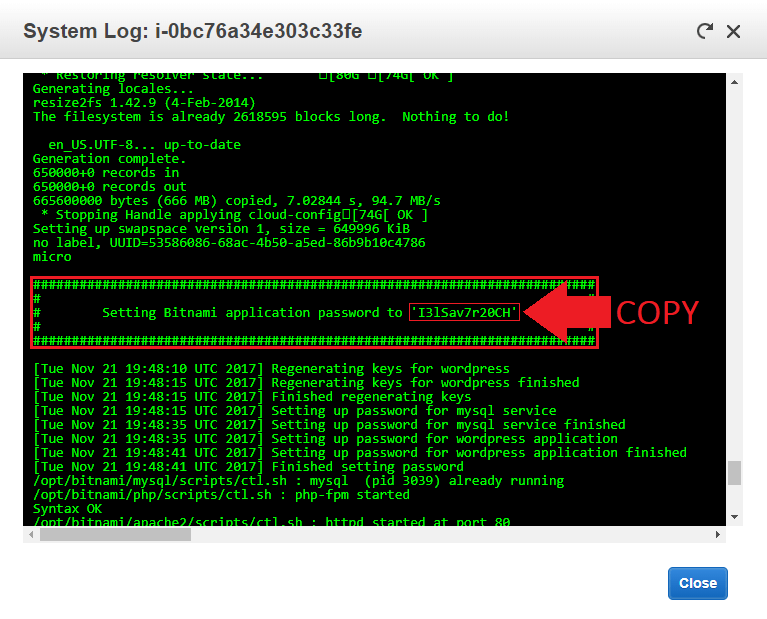 Here we are exporting wordpress website file from the wordpress site we already have & not the one we have launched on EC2?? If the above understanding is correct, I am not allowed to add plugin to my basic existing wordpress site. You will export the migration file from the site you already have, not the one you’ve already launched on EC2. Once you import the migration file into your your EC2 instance, all of your plugins/files/data will be overwritten by the contents from the new migration. Thank you, Leron for your reply. I think the problem with my website is that it is in the basic plan. So it doesn’t allow me to add/install any plugin. I contacted their customer service too. They asked me to upgrade the domain. However, as I am working on this as an assignment, I chose not to upgrade. With some research, I was successful in exporting my wordpress.com site using settings–>tools. So the migration part looks good now. Now I came across another problem. I am not allowed to change name servers settings in my wordpress.com domain settings. The reason is still the same that I need to upgrade my website by paying to a business plan. Can you please help me here? Do you know how to not pay/upgrade and still be able to change the domain settings? Or any other way I can achieve Step 2 i.e. transfering the domain? All of the tutorials on onepagezen.com are meant for users who are using the open-source WordPress (wordpress.org), not wordpress.com. It appears that you’re using wordpress.com, so your first priority (before using any of the tutorials on onepagezen.com) needs to be migrating your website off of wordpress.com, and moving to the open-source version of WordPress. For instructions on how to do this, check out this guide. Also – if your domain is something such as example.wordpress.com, you won’t be able to transfer it. WordPress.com owns those subdomains and you can’t use them outside of their site, regardless of whether you’re using a free plan. If I am just moving to AWSwith same domain name When I export from the old WordPress, should I enter the same domain in the box Replace with? If the existing site is already paired with the domain name, then there’s no need to use the ‘replace’ feature. If it’s a new site without the domain name configured, then yes – you could replace either the IP (if no domain is configured) or the existing domain name with the domain name that you plan to use when the site is migrated. When I try to restart the apache I get an error on line 563 and line 210, what should I do to fix this. If you open the file with the error in nano, you can use the keyboard command CTRL + SHIFT + – to jump to specific lines. Once you’ve jumped to the lines that have been flagged, check for syntax errors. Really great tutorial, a perfect step-to-step guide. However i just have one question. Does this tutorial works only for bitnami version of wordpress or it can be used for other AMI ? If you get a good grasp on the concepts covered in the tutorial, you should be able to easily apply the concepts to other AMIs. Most differences will be found in file paths/directory structure. I used a LAMP AMI that includes PhpMyAdmin. I installed new WP using their website’s instructions then imported the data from an existing WP install. I also used virtual hosts but that was only because I manage multiple WP blogs tied to different domain names. Hello! I tried doing this process, but I am running into a problem as my business account and domain was bought through google. Do you have any suggestions? What exactly isn’t working, is it the domain name or email? There shouldn’t be any issues configuring Gsuite and Google Domains with AWS, but if you provide additional details, I will see how I will be able to help. Leron, this worked flawlessly for me. Thanks for taking the time to share your knowledge, including providing solutions for all the roadblocks! Glad to hear it Graig – thanks for the feedback and I’m glad the tutorial helped you! Thanks so much for the awesome post!Everything was going swimmingly for me until it came time to use the password I copied from my system log. No matter how I enter it, it still says it’s incorrect? Any thoughts on a way to get around this …. such as changing the password somehow? Or perhaps what email it has this registered to so I can reset password? Did you make sure that you’re using the correct username? Try both user and admin for usernames. I’m really not sure what could be causing your issue. I would check out Google, StackOverflow, and the AWS troubleshooting docs and see what you find. If you’re able to find the solution, please share it as I am curious to know! Hey Leron, thanks for the nice and easy tutorial. I’m by no means an expert at this stuff, but does the migration above cover SQL and my database? Or does Bitnami cover all that? Okay, so I assume my database has already been uploaded to the new site as well? I thought that you have to go through myPHP, edit the wp-config.php file, and then import the database. Is that still something I have to do, or is it already done by the WP All-in-one migration plugin? I only ask because I don’t have back-end access to the hosting control panel of my current site, my website developers deal with that. So with migrating to AWS hosting, I’m just wondering whether I need to get anything from them on the back end, or is it completely done once I follow everything on the tutorial? The All-in-One WP Migration plugin takes care of moving your database. That being said, hosting your WordPress website on the cloud requires you to be familiar using a Linux shell to edit your website’s files from the back-end. You will inevitably have to do this from time-to-time in order to change file permissions, increase upload limits, or edit default settings. For this reason I’d recommend checking out this tutorial on basic Linux commands, so that you can get comfortable with editing your website from the back-end. Please suggest how to proceed further? This doesn’t look like a snippet from your error logs – it looks like a snippet from your bitnami.conf file. Great article Leron. Thanks for this great post. Can you please let me know how can I also transfer my SSL certificate to AWS? Unfortunately, transferring your certificate to a different server is a difficult process. What I would recommend doing is looking into this tutorial. Also, try accessing Google and StackOverflow for additional information. Great article, Thanks! but I’m exporting my website but it is showing you’re out of space what to now? If this isn’t the solution you were looking for, please provide more details about the issue that you’re trying to fix. Thanks Leon for your reply. I already solved this issue but now I’m facing a problem.. huuuh! But now tried new thing I don’t it is good or bad. I tried to install cpanel on my server so, I can do everything in that but cpanel installation also stuck at a point. I installed cpanel through SSH but when I entered https://myipaddress:/2087 in my browser to change my cpanel password it gave me a 404 error…. I don’t know what it happing with can you please guide me what to do now? Should I install cpanel for WP in ec2 because I can’t change my email and URL in simple WP installation or there’s any solution for that? There are many issues that you will run into when trying to configure cPanel on AWS. Most of the tutorials I’ve seen on the subject appear to be lacking. Regardless, I would not recommend installing cPanel on EC2. 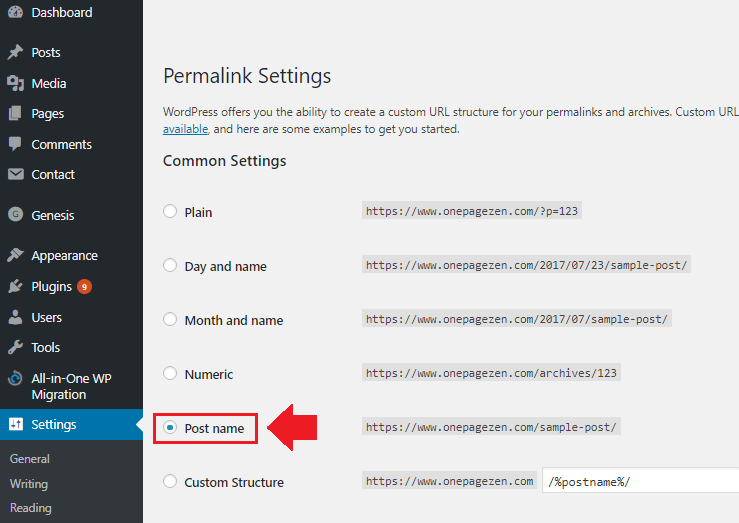 To change your WordPress domain name, check out step 2 of this tutorial. Even though the tutorial is for GCP, the same concept applies to AWS: SSH into your instance, open you wp-config.php file, and then add the WP_SITEURL and WP_HOME definitions to the file. Also, you can’t use default mail ports on AWS or GCP, so you will have to configure SMTP for your instance. The good news is that there’s a simple tutorial on the subject available here. Thanks Amin, finally I win and installed the WordPress with www. And with my own mail through SMTP. Now, I just have one question is there’s way to connect let’s encrypt SSL I mean is it the same process like you did in GCP? The instructions for configuring SSL on GCP vs. AWS are nearly identical. Just that you will be using Route53 for your DNS instead of Google’s Cloud DNS. Good luck and let me know if you’re able to get it working. Thank you this is an amazing guide. I couldn’t imagine the transfer being any easier. Do you have any resources for moving a Drupal site to AWS? Great tutorial, Leron. I have question, how should I change a wordpress password. I did try to do it as usually unfortunatly I was not able to access my app, could you so kind advising. Make sure to use the login username and password from the OLD website that you imported. Thank you Leron for your advise. Hi Leron, the tutorial looks great. 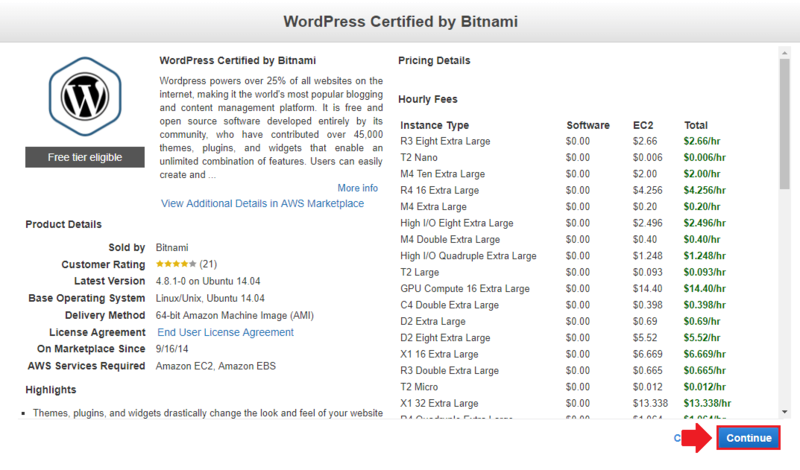 About to try it out for myself but i noticed the part about Bitnami WordPress. I see in the screenshot that there’s a bunch of charge totals on the rightmost column. Does this mean that I have to pay to use this? Sorry for the confusion. AWS provides you with a free year of EC2 (one machine) – so you won’t end up paying for most of those things. You will still have to pay for your networking, which would likely cost around $1 or so per month. Great tutorial, Leron. Maybe I missed it (I was jumping around), but might want to add something about changing the password on AWS’s WP instance. Otherwise smooth sailing. Great job and thanks for the help. Thanks for the feedback – I will look into the suggestion! Great article. Thank you for taking the time to share. I am migrating three WP blogs to an Amazon EC2 instance with a LAMP stack AMI and opted not use Bitnami but used Apache virtual hosts instead. Thanks for the feedback Max! I appreciate you for this tutorial. I am following you on all your videos and posts. I have a challenge. I followed closely but got it wrong at the point of making adding ‘www’ to the domain name. Mine is in double e.g. http://www.www.example.com. Kindly help me out with procedures to remove the ‘www.www’ completely. It sounds to me like there is an additional www. somewhere in your Apache configuration.